BART passengers wait for their train at Powell Street Station Sunday, Sept. 16, 2012. 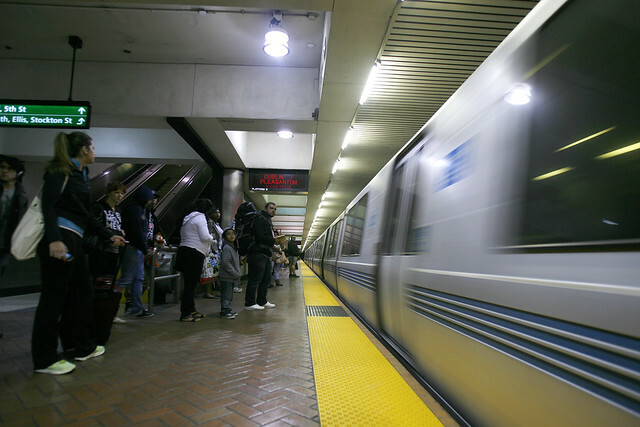 BART will conduct several community events this week in celebration of its 40th anniversary. Photo by John Ornelas. Forty years ago, BART slid open its doors and connected people from across the Bay Area. With a legacy of such expansion, the agency plans to continue its growth in the coming years. BART started service Sept. 11, 1972, originally servicing passengers between MacArthur and Fremont stations. BART now spans more than 100 miles to 44 stations, serving more than 375,000 riders Monday through Friday and more than 300,000 on weekends. BART, which has the oldest fleet in the country, has recently purchased 416 new cars. By 2017, the $896 million project should add an updated public announcement system, extra seating for seniors and people with disabilities, and more boarding doors to BART trains. “At 40 years old, we are carrying more passengers than ever and everything is starting to feel its age,” Trost said. Adding new cars with updated interiors brings Justin Bell relief, a freshman and theatre arts major at SF State. Although Bell lives on campus, he relies on BART to get him around the Bay Area. Sarai Vasquez, 21, a criminal justice major, said she uses the train regularly to visit her sister in the city, and she agrees it’s better than having to sit in traffic. Luis Ramos, freshman and business major, enjoys the convenience of using the free SF State shuttle to Daly City BART during his commute. There are plans to improve and expand BART even more over the next 40 years. New stations are currently being constructed in Antioch, eastern Contra Costa county and Warm Springs, which is south of Fremont. “We are all very excited about our fleet of the future,” Trost said. BART, the fifth largest heavy rail agency, plans to kick off its 40th anniversary celebration Sept. 19 with special promotions and events. The agency is asking passengers to share their vintage photographs of BART with the agency. Photos will be posted on BART’s Flickr and Pinterest accounts.